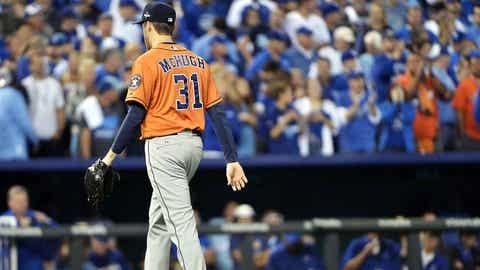 Collin McHugh and the Astros' magical ride came to an end on Wednesday night. The Houston Astros’ miraculous and (mostly) unexpected 2015 run came to a screeching halt on Wednesday, as they lost Game 5 of a tensely-fought ALDS to the Kansas City Royals by a score of 7-2. After seeing their eighth inning lead in Game 4 evaporate to force a Game 5, they just couldn’t solve Royals starter Johnny Cueto on Wednesday night at Kauffman Stadium. After the game, the players and manager A.J. Hinch sounded frustrated, but also proud of what they accomplished this season. Hinch summed up the team’s mood after the game, as captured by MLB.com’s Brian McTaggart and Jeffrey Flanagan: "It’s very tough. There’s not a man in that room that wanted the season to end. There’s going to be 29 teams that go through what we’re going through today. There’s going to be one champion. So it hurts. It hurts to know that we put everything that we could into this season and it ends abruptly. Seasons like this end really quickly, and you’re never ready for it. It never feels good." “This was a great ride. What a great group of guys we have. I didn’t want it to end.“ – Colby Rasmus on #Astros season. Rasmus: " It was an honor to be an Astro. I had a blast. I tried to lay everything out there that I could and play hard as I could." Rasmus: "Nobody is walking out of here not hurting, eyes swelling up. Man, what a pleasure to be an Astro this year." Instead of a deeper October run, the Astros now have to set their sights on a 2016 season that should find them stronger and more seasoned, especially now that their talented young core has a few weeks of pressure-packed October baseball under its belt. Altuve: "Everybody left everything they had on the field. That was it. We don't have anything more than that." Springer: "Obviously we’ve shown that we can go out & play w/ anybody & beat anybody. You have to tip your hat to those guys over there." Because that’s how baseball works, the Astros’ 2016 home opener will take place on April 11 against…the Royals.